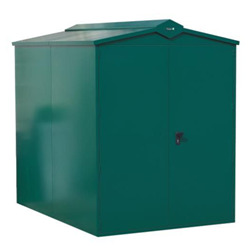 The Asgard Centurion metal shed is a high quality, high security building that is perfect for storing expensive tools, equipment, machinery or vehicles. It is available in a 7x5 size that will be able to accommodate plenty of your possessions. The Centurion features 1.2mm thick galvanised steel and 1.6mm thick steel housing lock protection.